Going fishing with kids? Get the gear that will make making memories a breeze. 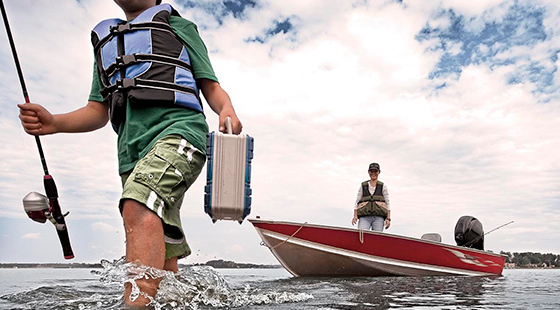 Beyond life jackets, fishing poles and baits, Rapala® tools, Sufix® line and VMC® terminal tackle will make it easier for you to mentor your future Master Anglers. If you’re taking younger kids fishing, your best bet for getting a lot of bites will be to target panfish. But if bluegills and crappie aren’t the species you usually chase when fishing on your own, you shouldn’t spool your youngsters’ rods with the same size line you use for bass, walleye or pike. When it comes to fishing line, one size does not fit all says Freshwater Fishing Hall of Fame Legendary Communicator James Lindner. “There’s a big difference in line type and weight — in how it functions and feels for specific fishing situations,” says Lindner, a director, producer and co-host of the influential Lindner’s Angling Edge television show. 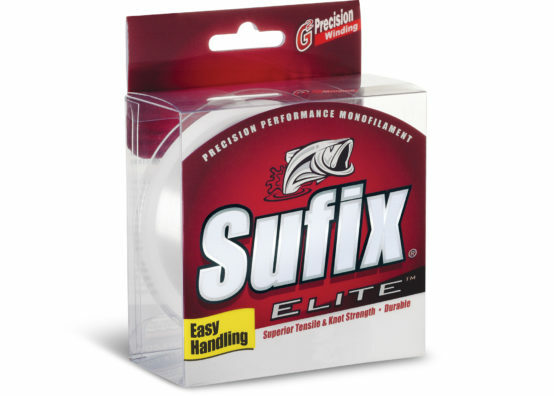 So before you take your kids fishing for panfish, spool their reels with 4-pound-test Sufix Elite monofilament line. Featuring unbeatable strength, easy handling, and superior tensile and knot strength, it comes in 10 test-strengths and four colors (camo, clear, hi-vis yellow and low-vis green). Because it’s soft and supple, even little ones can get cast small jigs on it farther than they would be able to cast them with a heavier, stiffer line. To prevent line twist when spooling your kids’ reels, lay your spool label-side down, run the line through a big book to put little pressure on it, and then reel slowly, making sure the line is coming off the spool in a counter-clockwise direction. Considering how easily kids can tangle lines and sometimes hook seemingly everything in sight but a fish, Rapala’s Panfish Tool Combo is an essential accessory for every youth-angler chaperone. 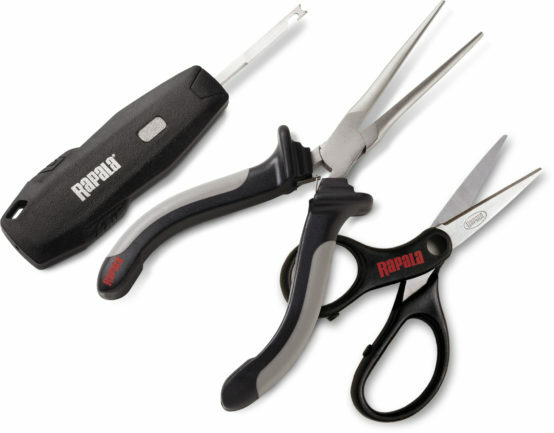 It features a Super Line Scissors, 4-inch Panfish Pliers and a Mini Hook Remover. Spoiler alert, kids have short attention spans. They’re likely going to want to change baits fairly often. Make the process easy with VMC Touch-Lok™ Snap Swivels. For one, they’ll eliminate line twist, which you’ll appreciate, since you’re the designated line de-tangler. Additionally, they feature a revolutionary snap that has a locking mechanism that is easy to open and close. For fishing bluegills and crappies with kids, get the smallest size. Above all, Nelson advises, allow your lil’ tykes to “determine the experience.” That can mean letting them explore before even making their first cast – walking through the woods, looking for grubs and night crawlers, checking out frogs, looking for turtles. Once on the water, Nelson advises, start the kids casting right away if they’re old enough. “If they get to cast, even if it’s not productive, that’s an active thing they can be doing,” he says. To help ensure at least a few bites, do a little research to find a “numbers lake,” Nelson advises. If you have the time, pre-fish it to key in on a “numbers” pattern. This entry was posted in Rapala, Storm, VMC and tagged elite, panfish tool combo], Rapala, Sufix, Touch-Lok Snap Swivel, VMC. Bookmark the permalink. All sponsorship requests can be submitted via the link below.